Chicopee ( ) is a city located on the Connecticut River in Hampden County, Massachusetts, United States of America. It is part of the Springfield, Massachusetts Metropolitan Statistical Area. As of the 2010 census, the city had a total population of 55,298, making it the second largest city in Western Massachusetts after Springfield. The current mayor is Richard Kos. Chicopee uses the nickname “Crossroads of New England” as part of a business-development marketing campaign. The name reflects the city's convenient location amongst a number of metropolitan areas and its transportation network. Four highways run through its boundaries: I-90, I-91, I-291, and I-391. State routes such as Route 33, 116, and 141, are major providers of regional linkage. The communities of Chicopee Center (Cabotville), Chicopee Falls, Willimansett, Fairview, Smith Highlands, Aldenville, and Burnett Road are located in the city. The city is named after the Chicopee River, whose mouth empties into the Connecticut River on in its boundaries. "Chicopee" is a Nipmuc word, probably from chekee ("violent") and pe ("waters") in most Algonquian dialects, with reference to rapids. The Nipmucs were the indigenous people of the lands that today make up the City of Chicopee, prior to the arrival of European colonists. Alternatively, chikkuppee ("of cedar") is the adjective form of chickkup ("cedar"). In 1636, William Pynchon purchased land from the Agawam Indians on the east side of the Connecticut River and moved from Roxbury to Springfield to found the first settlement in the area that comprises the territory of today's Chicopee Center (Cabotville). Both Cabotville and the Falls began as manufacturing centers (villages). According to local historian Charles J. Seaver, the area above the falls was first settled in 1660. The land purchased from the Indians was divided into districts. 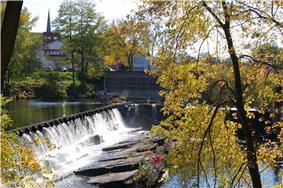 Nayasett (Nipmuc for "at the small point / angle") was the name given to Chicopee Center and Chicopee Falls. The settlement in the upper district was at Skipmuck (possibly based on Nipmuc "Skipmaug," meaning "chief fishing place" or "Shipmuck," meaning "big watery place"), a place above the falls on the south side of the river. A sawmill was the first river industry. The mill was built at Skenungonuck (Nipmuc for "green fields") Falls (now Chicopee Falls) in 1678 by Japhet Chapin, John Hitchcock and Nathaniel Foote. The mill was the first industrial site in Chicopee Falls. The saga of Factory Village really begins in the year 1786, when the property comprising two acres of land was leased to 10 local men with the understanding that they would build an iron foundry within two years. This was accomplished and the business flourished. 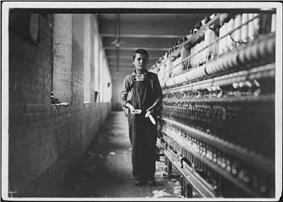 Child laborer in Chicopee, 1911. Photo by Lewis Hine. In 1823, Jonathan Dwight purchased the water privilege at Skenungonuck Falls in Chicopee. Five years later the textile mill had 14,000 spindles and nearly 500 looms, making it the second-largest operation in the state. By 1831, there were two giant dams, two waterpower canals and two manufacturing communities on the Chicopee River. In 1848, Chicopee - which, for over two centuries had been a part of Springfield - was partitioned off into its own town. Political factions in Springfield wanted Springfield to remain a town, rather than become a city and take on a mayoral form of government. By partitioning off Chicopee, those political factions prevented Springfield from becoming a city for four years - Springfield was chartered as a city in 1852; however, Springfield lost 2/5 of its land area and nearly half of its population when Chicopee was created. Before and after the partition, eight Chicopee River companies gained product recognition around the globe: Ames, Belcher, Lamb, Dwight, Stevens, Spalding, Fisk, and Duryea. Below the falls in the bend of the river at a place called Factory Village, an important chapter of the region's industrial history was played out. Chicopee adopted the motto "Industriae Variae", which means "Industry Varies". Chicopee was home to many types of industries which include cotton mills, woolen mills, textiles, Stevens Arms plant (later Savage) was responsible for most of the Number 4 Enfields manufactured for the British under Lend-Lease. Chicopee was home to production of the first gasoline-powered automobile made in the United States, the Duryea. Chicopee was the first city west of Boston to form a publicly funded public library. The Chicopee Public Library was formed by a donation to the city by the Cabotville Institute. In 1641, Willian Pynchon expanded his 1636 holdings by buying the land from the Chicopee River north to the Willimansett (Nipmuc for "good berries place" or "place of red earth") Brook. Land sales in Chicopee were recorded in 1659, but apparently no homes were built immediately. Winthrop McKinstry writes that the sons of Deacon Samuel Chapin appear to be the first home builders. Henry Chapin is believed to have constructed his at Exchange and West streets (lower Chicopee) in 1664, and Japhet Chapin north of what is now known as James Ferry Road (upper Chicopee) in 1673. It is apparent from McKinstry's book that the Chapin family dominated the area north of the Chicopee River for the settlement's first 70 years. Chicopee Street was part of the First Parish in Springfield. By the 1750s, Quabbin Road (now McKinstry Avenue) allowed the farmers to access the meadows and fields on the plains at the top of the hill. The Chapins used the land in common for grazing livestock and built ice houses near several large ponds. The ponds were drained by several brooks which flowed into the Connecticut River. At the end of the 19th century, the city voted to build the Willimansett Bridge, connecting Willimansett with Holyoke. The results were profound. Willimansett and Aldenville would develop close ties to Holyoke; even postal and telephone service were (and still are) tied to the "Paper City." The legislative act ordering the building of the bridge was passed in 1892. L.L. Johnson reports that the completion of the bridge was grandly celebrated. By the 20th century, Willimansett village had developed into quintessential Americana with a high percentage of French Canadian inhabitants. In total, Chicopee became four distinct commercial and political sub-divisions, each with its own ethnic makeup representing its own special interests and, much too frequently, in conflict with each other. Located between Fairview and Willimansett, the Smith Highlands section once had its own school (first and second grades), Holyoke Steet Railway bus service from Ingham Street across Irene, Factory, and Prospect streets, and two locally owned markets. The former Robert's Pond swimming area was a popular summer attraction, and the fields where the current Bellamy Junior High School is located were a popular sledding and skiing location winters. Fairview is the northern-most neighborhood (village) in Chicopee and originally included the lands that are now part of Westover ARB. Primarily agricultural, Fairview was known for its tobacco farms. After 1939, Westover helped to rapidly develop the village into a residential and commercial district. Memorial Drive (Route 33) flows North-South connecting Chicopee Falls with South Hadley. On August 18, 1870, Edward Monroe Alden purchased 600 acres of land just east of Willimansett for the sum of $9,000 with the intent to create a "little city on the hill," which would become Aldenville. In 1890, he began laying out streets which he named for family members and divided the land up into 60-by-170 feet lots. French-Canadian factory workers from Chicopee Falls, Cabotville (Chicopee Center), and Holyoke began to build up the community. Sold for a selling price of $150 with $10 down, the first house was bought and built by French-Canadian builder and carpenter Marcellin Croteau. The villages of Cabotville, Chicopee Falls, Willimansett, and Fairview (and the lands that would become Aldenville) remained a part of Springfield, Massachusetts from 1636 until 1848, when they were partitioned to form the Town of Chicopee. Political factions in Springfield had wished to keep Springfield a "town," instead of becoming a "city," which would give it a mayoral form of government. To keep Springfield sufficiently unpopulated to subvert a state regulation that would have required it to become a city, they partitioned Chicopee, which contained approximately 2/5 of Springfield's land area, and nearly half of its population. Regardless of the partition, Springfield became a city only four years after the partition of Chicopee. Both cities continued to flourish for over a century after the partition. 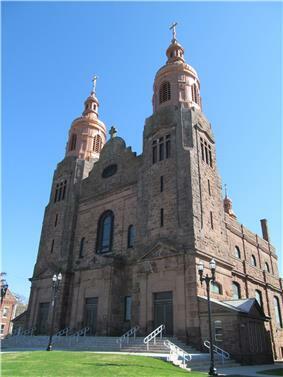 On April 18, 1890, the community was granted a charter as a city by the St. Stanislaus Bishop and Martyr Church, located on Front Street, was proclaimed a minor basilica by Pope John Paul II. Chicopee is located at (42.170159, -72.588630). The city is made up of several neighborhoods; the result of the city's origin as a collection of four villages in the northernmost part of Springfield, which seceded from it in 1848. Chicopee Falls, Chicopee Center (Cabotville), Fairview, and Willimansett continued to develop. In the early 1900s, Aldenville developed as a distinct community. Since then, the city has filled in most of its open space resulting in a number of new neighborhoods. These neighborhoods include Chicomansett, Ferry Lane, Sandy Hill, and the geographically isolated Burnett Road neighborhood. The city is bordered by Holyoke to the northwest, West Springfield to the southwest, Springfield to the south, Ludlow to the east, Granby to the northeast, and South Hadley to the north. Chicopee is located 29 miles (47 km) away from Hartford, 92 miles (148 km) away from Boston, 90 miles (140 km) from Albany, and 140 miles (230 km) from New York City. According to the United States Census Bureau, the city has a total area of 23.9 square miles (62 km2), of which, 22.9 square miles (59 km2) of it is land and 1.0 square mile (2.6 km2) of it (4.31%) is water. The Chicopee River flows through the south part of the city, feeding into the Connecticut River. Many ponds, lakes, and streams are part of the Chicopee River or Connecticut River watersheds. Willimansett, and portions of the Center and Falls are on low land, with Aldenville, Fairview, Westover, and the Burnett Road neighborhoods on an elevated plateau. At 285 feet, the highest elevation in the city is on Old Lyman Road, in the Fairview section. The Chicopee Fest-of-All is a Fourth of July celebration in Szot Park featuring live bands, games, local foods, and fireworks. 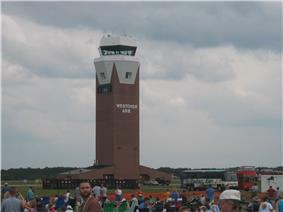 The Great New England Air Show is an annual two-day air show held at Westover Air Reserve Base. 300,000 visitors attended in 2008 to a show that featured the USAF Thunderbirds. Approximately 210,000 attended the highly anticipated 2012 show, Although no major jet-team headlined the show, military demonstrations by the F/A-18F Super Hornet, F-15C Eagles, V-22 Osprey, B-2 Spirit Stealth Bomber, and a locally based C-5 Galaxy along with civilian aerobatics and warbirds kept spectators entertained, over 60 aircraft were on static display making it the biggest airshow to take place at that location since 1974. The next air show is scheduled for May 16 and 17, 2015 celebrating the 75th anniversary of Westover ARB with the US Navy's Blue Angels headlining in their first appearance at the base. The Sword Game is an annual football game that began in 1964 after the founding of Chicopee's second high school, Chicopee Comprehensive High School. It is held every fall between Chicopee High School and Chicopee Comprehensive High School. The city's mayor presents the winning team with the Mayor's Sword, a sword that was manufactured in the 1890s by Ames Manufacturing Company in Cabotville. The World Kielbasa Festival is a four-day fair featuring Polish food, polka dancing, games, and rides. It returns May 15–18, 2014 at Szot Park. The original K-Fest was held by the Chicopee Chamber of Commerce's Fireball Club and ran from 1974 until 1997. A tank in Szot Park. Ames Tower - in Cabotville, it was formerly part of the Ames Manufacturing facilities and is now part of the Ames Privilege Apartment complex. Frank J. Szot Memorial Park - is a focal point for community events in the city with accommodations for baseball, basketball, and picnicking. The stadium is typically used for local and regional soccer and football games. 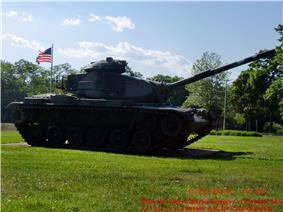 Features include a pond, two WWII tanks, several war monuments, and a fountain. Chicopee Memorial State Park - is located in the Burnett Road neighborhood and formerly known as the Cooley Brook Reservoir and Watershed, the Chicopee Memorial State Park has been developed into a high use active recreation area. The total area is 575 acres (2.33 km2) including two 25-acre (100,000 m2) ponds. Activities include swimming, fishing, picnicking, jogging and biking. In the first episode of the second season of American Horror Story, Chicopee is referenced as a location for reporting Canada Geese migration by character Lana Winters. 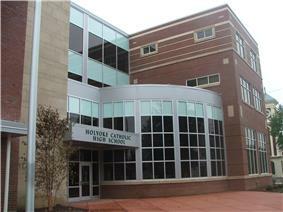 Holyoke Catholic High School was founded in 1963 at the campus of the former Saint Jerome High School in Holyoke. 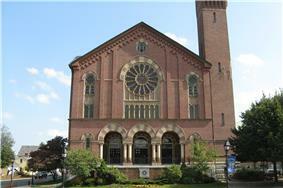 In 2002 it relocated to the campus of Saint Hyacinth Seminary in Granby. It moved to its current location in September 2008. Within the past decade, a number of private elementary schools and their associated parishes have closed. These include Assumption School which served the former Assumption of the Blessed Virgin Mary parish, Saint Patrick's School which served the former Saint Patrick's parish (closure of this parish is currently in dispute), Holy Name School which served Holy Name of Jesus parish, Mount Carmel School which served the Nativity of the Blessed Virgin Mary parish, and Saint George School which served Saint George's parish that merged with Saint Rose de Lima / Saint Joan of Arc School. Chicopee has a multitude of Catholic schools that are operated under the Diocese of Springfield. These schools include: Saint Joan of Arc School which serves Saint Rose de Lima Church on Grattan Street; and Saint Stanislaus School which serves the St. Stanislaus Bishop & Martyr's Parish Bishop and Martyr on Front Street. The City of Chicopee operates fifteen public schools within the Chicopee School District, serving 7800 students. Richard W. Rege is the superintendent. There are nine elementary schools, two middle schools, one early childhood center, and three high schools (Chicopee High School, Chicopee Comprehensive High School and Chicopee Academy). The College of Our Lady of the Elms is a four-year liberal arts college offering thirty-three academic majors. 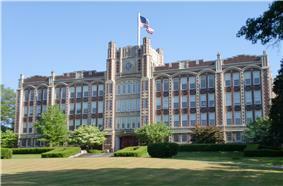 It was first founded in 1897 as a girls' preparatory academy in Pittsfield, the Academy of Our Lady of the Elms. In 1899, it moved to Chicopee as St. Joseph's Normal College. A charter for the school to operate as a women's liberal arts college was approved in 1928, and the name was changed to the College of Our Lady of the Elms. It began admitting men in 1998. The median income for a household in the city was $35,672, and the median income for a family was $44,136. Males had a median income of $35,585 versus $25,975 for females. The per capita income for the city was $18,646. About 9.6% of families and 12.3% of the population were below the poverty line, including 19.5% of those under age 18 and 9.3% of those age 65 or over. In the city the population was spread out with 22.6% under the age of 18, 8.5% from 18 to 24, 28.8% from 25 to 44, 22.5% from 45 to 64, and 17.6% who were 65 years of age or older. The median age was 39 years. For every 100 females there were 90.7 males. For every 100 females age 18 and over, there were 87.1 males. There were 23,117 households out of which 26.5% had children under the age of 18 living with them, 42.6% were married couples living together, 14.2% had a female householder with no husband present, and 38.8% were non-families. 32.7% of all households were made up of individuals and 14.1% had someone living alone who was 65 years of age or older. The average household size was 2.32 and the average family size was 2.96. As of the census of 2000, there were 54,653 people, 23,117 households, and 14,147 families residing in the city. The population density was 2,389.7 people per square mile (922.7/km²). There were 24,424 housing units at an average density of 1,067.9 per square mile (412.3/km²). The racial makeup of the city was 89.82% White, 2.28% African American, 0.20% Native American, 0.87% Asian, 0.10% Pacific Islander, 4.90% from other races, and 1.84% from two or more races. Hispanic or Latino of any race were 8.76% of the population (12.8% Puerto Rican, 0.5% Dominican, 0.4% Mexican, 0.2% Colombian). 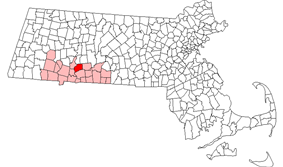 Chicopee is the second largest municipality in Western Massachusetts, after Springfield (defining Western Massachusetts as Hampden, Hampshire, Franklin, and Berkshire counties). Originally settled by several English families, after the city's industrial revolution its population was redefined by the nationality of its immigrant occupants, predominantly Polish and French Canadian. While this strong immigrant heritage is still pronounced throughout the city; assimilation and migration contributed to Chicopee's transition from a collection of ethnic communities into a unified and multi-ethnic city. The Chicopee River Business Park and Westover Business Park are within the city's boundaries. Chicopee is also home to Alden Credit Union, The Polish National Credit Union and Chicopee Savings Bank. Chicopee Savings Bank is run by Chicopee Bancorp, which operates trades as CBNK on the NASDAQ exchange. Chicopee is the home base of Buxton Co., LLC, which "designs, manufactures, and markets personal leather goods, travel kits, and gifts collections for men and women." Founded as L.A.W. Novelty Co. in 1898, the firm changed its name to Buxton Co., LLC in 1921. Chicopee is mostly a service economy with a mixture of small, local businesses and national chains. Reflecting the city's history, many business are Polish-American and include the Chicopee Provision Company, a major producer of Polish sausage kielbasa under the Blue Seal brand, and Millie's Pierogi, a producer of traditional Polish dumplings called pierogi. The Chicopee City Hall - was built in 1871 in the Romanesque style. It was added to the National Register of Historic Place on July 30, 1974. 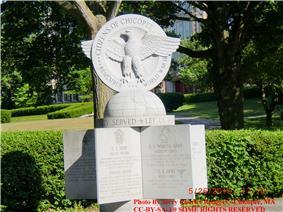 The Chicopee War Memorial - is located off of the intersection of Bonneville Avenue and Front Street. It is home to several statues and monuments to World War II veterans and Vietnam War veterans. 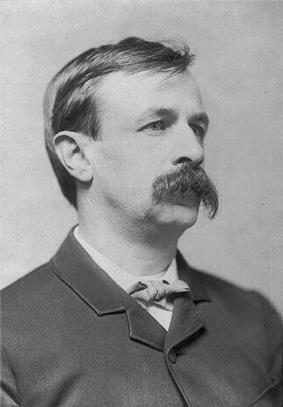 The Edward Bellamy House - is a National Historic Landmark at 91-93 Church Street in Chicopee Falls, Massachusetts. 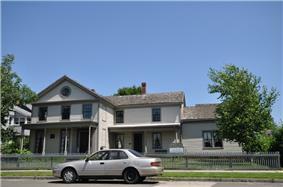 The house was built in 1852 and was the home of journalist Edward Bellamy. The house was added to the National Register of Historic Places and designated a National Historic Landmark in 1971. The Emerson Gaylord Mansion - is a historic mansion is located at the north edge of the Elms College campus on the corner of Springfield and Fairview Streets (199 Springfield Street). It is described by Kristin O'Connell ("The Architectural Heritage of Chicopee") as a less pure example of the French Second Empire style, because of its asymmetrical exterior and its unusually high steep roof. The Facemate Tower - is a historic tower on the Chicopee River in Chicopee Falls. It was formerly a part of the Facemate Industrial Complex. The Polish Center of Discovery and Learning- is a local history museum celebrating contributions made to the economy, arts, and sciences by immigrant Poles and their ancestors in Western New England. The museum also sponsors regular workshops, exhibits, concerts, conferences, seminars, films, plays, and lectures regarding the cultural traditions, contributions, and history of Poland, the Polish people, and the Polish diaspora. The Uniroyal Office Building - is a historic building in Chicopee Falls that is formerly part of the Uniroyal Industrial Complex. The Willimansett Dike - is an elevated, artificial levee in Willimansett, built after the destructive Willimansett flood caused by The Great New England Hurricane of 1938. It stretches from Nash Field, following the Connecticut River south to I-90 bridge adjacent to the Chicopee boat ramp. Westover Air Reserve Base - was built here in 1940. It has one of the largest runways on the east coast at 11,597 x 301 feet (92 m). This is also home to Westover Metropolitan Airport. ^ "Textiles, Apparel and Luxury Goods: Company Overview of Buxton Co., LLC". businessweek.com. Retrieved April 13, 2012.